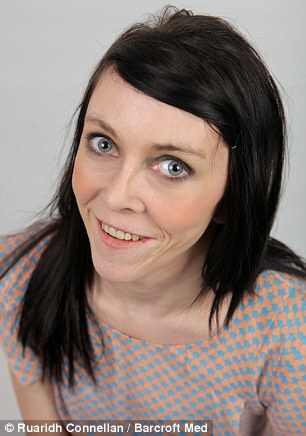 A teenager who suffers from a rare genetic condition which makes her look middle-aged has been given new confidence thanks to pioneering facelift surgery. Zara Hartshorn, 16, from Rotherham, south Yorkshire, had to endure years of cruel taunts and even physical abuse because of her appearance. 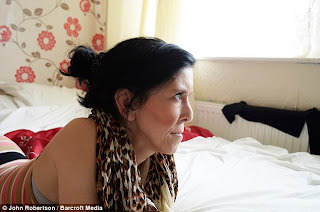 She inherited lipodystrophy - which makes her skin looked wrinkled and twisted - from her mother Tracey Gibson who also suffers from the illness. But after hearing of her condition, a top surgeon in the US offered to perform cosmetic surgery for free. It has proved to be a complete success and Zara has felt able to start a relationship with new boyfriend Ricky Andrews and is even keen to go to college. It is a remarkable change of fortunes for the teenager who was once left in tears after being made to get off a bus for not being able to prove she was eligible for a child's ticket. 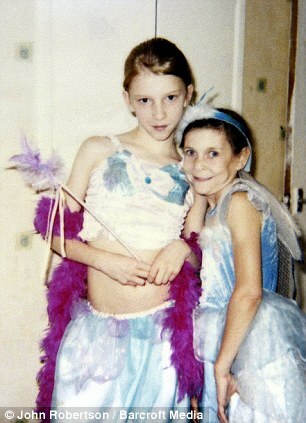 By the time she was 12, Zara was already being mistaken for a middle-aged woman - and was even mistaken for 17-year-old sister Chloe's mother. But now thanks to a lifeline by a surgeon in the US Zara feels indistinguishable from her peers. Dr Abhimanyu Garg told Zara her condition is actually cutis laxa, an even rarer disease which only affects 30 people in the UK. And Zara, who one day dreams of owning a beauty salon, says she is ready to leave the past behind and forgive her tormentors. She said: 'Before I had surgery I was picked on for looking different, now I look the same as other girls my age. 'I don't feel like people are staring at me when I walk down the street anymore. I finally feel like a teenager. Her newfound self-assurance has helped her start a relationship with apprentice painter and decorator Ricky, 22, three months ago, who she met through friends. She said: 'I've had boyfriends in the the past but I don't think any accepted my condition, really. But with Ricky it's never been an issue. Growing up Zara put her rapid aging down to lipodystrophy - a genetic illness which decays bones and destroys fat beneath the skin. 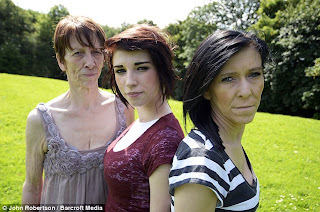 At age four doctors told her she had inherited the condition from Tracey after she developed excess skin round her jawline. Zara said: 'Mum explained that I had an illness like she did, but that I was beautiful and shouldn't pay any attention to what anyone said. 'The bullying was worst between the ages of eight and ten. Kids used to call me monkey and granny and I was even beaten up just because of how I looked. But even after changing schools Zara's life was made a misery because of her illness. She recalled: 'I lived in fear of being asked how old I was. After Zara's plight was made public she was contacted by lipodystrophy expert Dr Abhimanyu Garg, from Texas, US, who asked to carry out some tests on Zara and Tracey. The pair were found to be suffering from cutis laxa, an even rarer condition which can shorten life expectancy, weaken joints and can lung and heart problems. Although hard news to take in, Zara was later presented with the offer of a facelift and nose augmentation free of charge by top surgeon Dr Robert Ersek. She said: 'It was an amazing opportunity that I could never of dreamed of before. 'When I saw myself in the mirror after the bandages all came off it was mixture of surprise and happiness. And thanks to her confidence boost, Zara is determined to go to college and achieve her ambition. She said: 'I feel much more confident and just happier in general. 'I'm now able to do things like going to college and having a career which I might not have felt possible before. 'The surgery has given me a boost and now I don't fear what other people think. And poignantly, Zara says she is all the more determined to live a happy, normal life because of the support she has had from her mother Tracey. She said: 'I know I'm lucky to have had the opportunity and it's something my mum would have loved to have been offered. 'I want to make something of my life for her - to make her proud. 'I know I'll always have this condition and it may shorten my life, but at least I can feel more like comfortable and confident. 'Although I look younger I still feel older than my years because of everything I have been through. Some people can look into someone's heart.